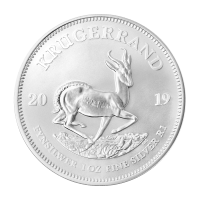 Moneda de Plata Krugerrand 2019 de 1 oz Purchase your 1 oz 2019 Krugerrand silver coin today from our online store to enjoy the web’s lowest price! This dazzling release marks the second time that the renowned South African Mint has offered this industry legend in brilliant uncirculated silver. The reverse bears the classic image of South Africa’s national animal, the Springbok Antelope, traversing the ‘veld’ of its homeland. Set within a light, decorative frame, you’ll also find the ‘Krugerrand’ title and the year of issue, along with details of content (shown in Afrikaans and English), weight and denominational value. The obverse bears the likeness of the final president of the former South African Republic (which later became known as Transvaal), Paul Kruger, who lived from 1825 to1904. Also on the obverse, within a decorative frame, the South African legend in both Afrikaans and English. While Paul Kruger is considered a controversial figure due to his status as the ‘face of the South African ‘Boer,’ his death actually precedes the beginning of the Apartheid regime by 44 years and the bullion coin that bears his name is considered a welcome and much needed source of revenue for the New South Africa. Celebrate the Rainbow Nation and enliven your portfolio with a 1 oz 2019 Krugerrand silver coin today.